for seagoing ships flying the German flag. have put their information on these pages. There are seagoing ships and inland vessels. Seagoing ships travel the oceans and along the coasts. Inland vessels travel on canals, rivers and lakes. We take care of the safety of seagoing ships. But only seagoing ships from Germany. These ships fly the German flag. We make sure these seagoing ships are safe. good working conditions on board. The working hours need to be followed. The work place has to be tidy and in good repair. Seafarers have to be paid on time. of seafarers are good too. Seafarers live on board the ship. Their rooms have to be tidy. They need to get enough to eat and drink. in a way you understand easily. You are totally or partially deaf? Please click on the word DGS at the top right of this page. DGS means German sign language. You can watch a video in German sign language. Do you want to read our pages in German? At the top right you can find a German flag. A click on it will lead you to our internet pages in German. What else is at the top right of the page? not just us, the German Flag State Administration. Maritime links lists these organizations. you will get to the internet pages of it. requires the seafarer to call a particular place. Who does he have to call in case of an accident? And who in case the ship is in danger? he will get the help he needs quickly. The blue button leads to our 24/7 Hotline numbers. You can call by day and by night. you can register for our newsletter. You can read older newsletters too. You want to get back to the start? Our home page is the first page. Click on the logo to get back to the start. You are looking for information. But you cannot find it on our pages. in the box next to the magnifying glass. where this word occurs on our pages. are the topics of the German flag. more topics that belong to the topic will flip open. These can be chosen with a click too. show you where you are at the moment. why ships are so safe under German flag. We tell you how a ship can get the German flag. In Crew we tell you about seafarers. We say what seafarers can and cannot do. We tell you about life and work on board a ship. 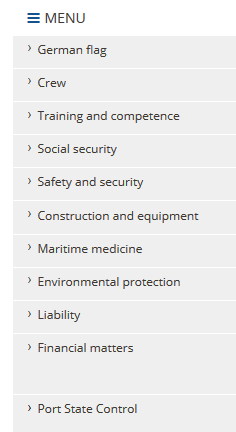 we tell you what a seafarer needs to learn to work on a ship. so that ships are safe. A health insurance pays for the treatment when a seafarer falls ill.
An unemployment insurance pays when he looses his job. When he is ready to retire, the pension insurance pays. There are some more important insurances. Then you can read all about Safety and security for ships. We tell you about the technologies that keep ships safe and secure. And how to safeguard from pirates. Cargo has to be loaded and transported safely. and how to prevent accidents from happening. The heading Maritime medicine deals with sick seafarers. Sick seafarers should get well quickly. Only very few ships have a doctor. That is why we teach seafarers how to help. Everyone who wants to go to sea is examined by us first. We check if the person is able to do the hard work on board. we explain how to protect the environment. Seafarers must not throw their rubbish over board into the water. We make sure that chimneys do not pipe out toxic smoke. it cannot simply be sunk somewhere. We take extra care when ships transport dangerous cargo. Liability has to do with insurance. A ship owner lets a ship sail that is far too old. he has to pay to have it repaired. he has to pay to have the water cleaned. All of this costs a lot of money. Insurances help to pay so much money at once. The heading Financial matters deals with money. We show how the state helps people who own ships. They have to pay very little tax for their ships, for example. The state gives money when they train seafarers on their ships. if all the rules on board the ships are kept. it may not leave the port. It is put in chains. At the bottom of the page is a blue wave. All of these topics are listed there again. The German flag service topics are given on the blue bar. the topics belonging to this main topic flip open. Click on the topic that you want to choose. Latest information gives you current but also older information. You can find job offers at the authorities of the German flag. a contact person for a topic. You are given the postal address, telephone number and e-mail address. You can call the hotline day and night. Under this heading we also explain what each authority does. to download onto your computer. that is important for shipping under German flag. can check which certificates a ship or a seafarer needs. He can check how much the certificates cost. And if the certificates are the real ones. or that a seafarer is doing well on board the ship. Look under Training to find training place on board a ship. for the training places on board ships. You can find out in the line underneath the big picture. to find their way back again later. are your trail back to the home page.